Cruise to the best of Asia and Oceania on board the Ovation of the Seas, and experience the non-stop fun of a Royal Caribbean cruise. The newest ship in the Quantum Class, the Ovation of the Seas, will ensure you enjoy the best entertainment, dining and living on the seas. Every night you can see high quality Broadway-style theatre shows and the technically amazing ‘Spectra’s Cabaret’ will leave you astounded. To experience some aerial thrills and exhilaration of flying in a safe atmosphere, visit the ‘RipCord’ by iFLY. For something more relaxing - the ‘Vitality Spa’ and adults-only solarium pool are the perfect hideaways. The Ovation of the Seas does not disappoint for dining, with a huge choice of meals at the ‘Windjammer Marketplace’, a taste of the states in the ‘American Icon Grill’ and the elegant and delicious experience in ‘The Grande’. The multitude of different bars and lounges on board are sure to keep your thirst satisfied. The ‘Bionic Bar’ is an amazing way to be served, as robots mix and serve you fine cocktails, while ‘Boleros’ is the perfect place to test your samba and salsa dancing skills, celebrating another unforgettable day on the Ovation of the Seas. After a day of exploring the world, its exotic cuisine and interesting cultures, there's nothing better than returning to the comfort of your private stateroom. 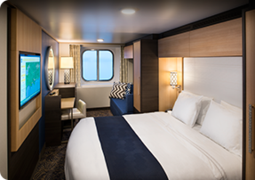 Every stateroom is designed to be a comfortable, relaxing place for you to rest after your adventures. A highlight of living on board is the two-storey loft suite, which is the most spacious and indulgent on board, including five bedrooms, two bathrooms and a private balcony including a whirlpool. 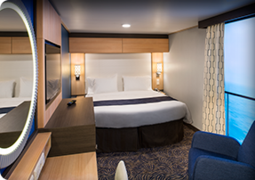 No matter which cabin category you opt for you are sure to have a luxurious and comfortable place to call home for the duration of your cruise. My Time Dining gives you the flexibility to choose your own time and table companions each evening and My Family Time Dining is also available for families with children 3-11 years where kids can enjoy their meal within 40 minutes of seating. The culinary experience is wide ranging, from Jamie's Italian which serves a menu inspired by Italian cuisine which is designed by celebrity chef Jamie Oliver to Izumi, a feast for the senses serving Japanese dishes prepared with the freshest ingredients and providing you pure and delicate flavours. On board the Ovation of the Seas there is a huge array of entertainment options, from activities and shows to relaxation. The North Star is the perfect way to see the world from an astounding 90 metres from sea level and RipCord by iFLY will give you the sensation of skydiving while being at sea. The SeaPlex is the largest indoor play area at sea with bumper cars, a roller rink and even a circus school with flying trapeze. To sit back and be entertained, the Two70 lounge is the place to go. During the day it is a casual lounge with breathtaking views and at night it transforms to a the venue for spellbinding aerial shows which will mesmerize you with a blend of innovative video projection, robotics and human talent. 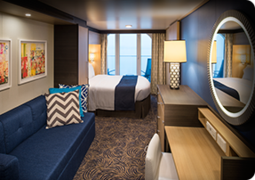 The ship boasts a sea of fitness and relaxation oppurtunities on board. To challenge yourself, try to reach the top of the rock wall or even test out your surfing skills on the FlowRider. Relaxing is also a massive part of the time on board, with the Vitality Spa boasting signature treatments like facial treatments, massages and acupuncture guaranteed to leave you feeling refreshed and relaxed. Find your favorite new boutiques in the middle of the sea, featuring the name brands you love – at prices land can't match. Onboard, you'll enjoy tax-free, duty-free shopping on a wide selection of unique jewelry, apparel, art and more. Brands such as Coach, Tiffany & Co., Guess and a variety of art are available to purchase on board, should you choose to. The Ovation of the Seas from Royal Caribbean International is a Quantum-Class ship. Entering service in 2016, it’s joined in the class by the Quantum of the Seas and the Anthem of the Seas. With a length of 330 meters and with a capacity of 4,905 passengers and 1,500 crew, it’s one of the largest ships at sea. The Ovation of the Seas is one of the most modern ships in the world, it uses the latest and most innovative activities to keep its guests entertained. Onboard, you will find the Ripcord by iFly, this is a skydive simulator on the water. Furthermore, it has the North Star. This is a jewel-shaped capsule with a long arm stretching over the sea. 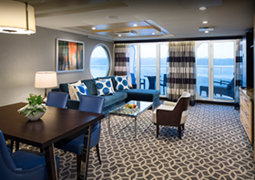 Here, passengers in the cabin can take in the breathtaking 360-degree view of the whole ship and ocean. There is also a casino on board called the Casino Royale. This casino has slot machines and tables where games such as roulette and blackjack can be played. Finally, it is possible for shoppers to shop in the promenade aboard the Ovation of the Seas in one of the many duty-free designer shopping. Royal Caribbean has developed a new, dynamic, dining system that changed the entire eating style aboard the Ovation of the Seas. There are a lot of new options, flexibility in the culinary meals and there are no fixed mealtimes. Also, the best chefs in the world, such as Jamie Oliver, are engaged in preparing the tastiest, dynamic and exciting meals. It is possible to see how the best chefs are busy preparing your meals as there is an open kitchen in the restaurant area. The Ovation of the Seas is homeported in Sydney for the 2017 and 2018 season, and then in the off-season in will be sailing in the northern hemisphere around Asia. For a review of the ship and more information about what is onboard then take a look at our blog post from one of our cruise experts who was onboard. For more information on the itineraries and offers take a look through the offers on the right or call our cruise experts on 1300 877 590.